This survey shows a widespread adoption of software tools to manage software development projects as more than four respondents out of five were using one tool or more to plan, estimate or track their project activities. It is also interesting to see that open source project management tools are used at a rate very close to commercial tools. This could be influenced by the fact that project management was one of the first initial target of open source projects leading to the development of many products like Redmine or Project.net. This was then intensified by the adoption of agile approach that leads to the development of open source Scrum software like Agilefant or IceScrum. The absence of software tools doesn’t necessarily imply the lack of project management practices. Agile approaches recommend small-collocated project teams and face to face communication. The usage of physical visual boards and paper cards for the backlog and sprint management activities can make sense in this context. 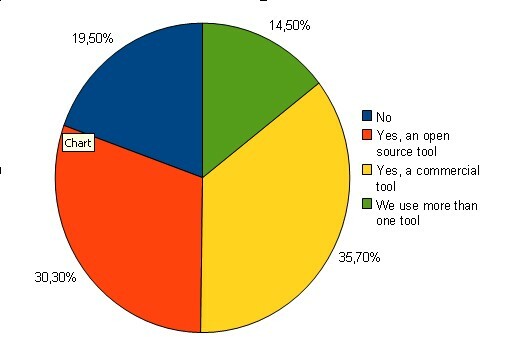 The survey results seems to be inline with other surveys on the same topic, like the “Agile tool survey results”  performed in 2010 where 25% of the respondents use physical wall and paper to manage their projects, but around half of them complete this with some software tool, thus leading to a just below 90% usage of software tools. It is also true that 70% of participants in this survey were working in small and collocated teams. The VersionOne Survey  of 2011 shows that around 50% of the recipients are using agile or traditional tools. Around 10% of participants say that they will not need to use such tools. This survey also reveals that the tool most used by Agile projects is Excel. But the results of this survey might also be biased by a higher percentage of customers of the survey organizer. The usage of tools in Agile projects might have increased in recent years, as a global agile survey done in 2006  showed that around 40% of the respondents were manually planning and tracking their iterations.